When the advent of the automobile increased traffic through Burke, several service stations arose to sell them oil, gasoline, and a soda water. The first business that could be called a "service station", i.e., a business that services the needs of automobiles, was Earl Kellow's "garage." The business was probably established before 1920 as a blacksmith shop since the 1920 census describes Kellow as a "blacksmith" who owns a "shop". In 1910 Kellow worked as a laborer in a lumber mill, perhaps the Edens mill at Burke. It is likely that Kellow originally catered to horse-drawn wagons and buggiess and transitioned to automobile repair when they began to travel through Burke on the old Houston Road in substantial numbers in the 1920s. A blacksmith shop would have been a natural stop for cars experiencing mechanical problems, and it was a natural progression to selling gas and oil. In the late 1920s, Kellow sold the business to Robert E. "Uncle Bob" Weisinger who ran it as a Gulf station until the early 1960s. It is unknown whether Kellow sold gasoline or whether that was added by Weisinger. Since Bob Weisinger was never known as a mechanic, gasoline was probably added by Kellow before the sale. 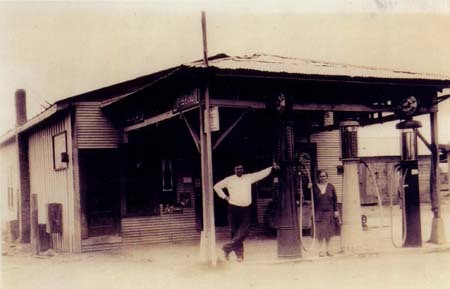 Shortly after World War I, Hollis and Hamilton Parrish built a service station at Burke next door to Earl Kellow's garage, which later was bought by Bob Weisinger. They operated the business until early 1924 when Hamilton died from the effects of mustard gas injuries he received during World War I.
Hollis Parrish and Hamilton Parrish's widow sold the station to Hamilton's and Hollis' sister Tusie Smith and her husband Claude. The first photo above shows that the station was branded as Magnolia. They operated the store and gas station until March, 1933 when they sold it to Sam Courtney. After leaving Burke, the Smiths ran another store in Copestown. Courtney sold the station to Jim Spears, who eventually moved it to a new building on U. S. Highway 59.
right and the Weisinger Gulf on the left. Bob Weisinger transformed the Kellow garage into one of the best known businesses in Burke, Weisinger's Gulf. In the 1930's Luther Courtney opened a service station on Texas 35 on the south end of Burke. He moved it to U. S. 59 when the new highway was built and later sold it to R. L Campbell. Campbell and Drew Holder operated the store together, and at one time their father-in-law C. B. DuBose was involved in the store before he opened a store in Beulah. In the 1950 R. L. Campbell, who was also the rural mail carrier, ran a small store on the west side of U. S. 59 on the southern end of town. He sold the store and continued as mail carrier for many years. In the 1960s, Hank and Mary Keels operated the store for several years. Eventually the store burned and was never rebuilt. 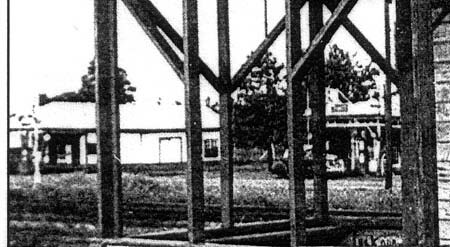 Jim Spears purchased the old Smith Magnolia in 1937 and moved it to U. S. 59 when it was constructed. The Spears Store and Station was one of the last successful stores in Burke. Drew Holder ran a small store in the building that later became the Burke Post Office Substation.